Spice things up with this Himalayan pink salt plank that will tantalize your tastebuds and dazzle guests. Himalayan salt has a very stable crystal structure, which allows it to hold a temperature very well. You can chill it to use as a serving platter for sushi, or heat it over a grill or stovetop to cook your veggies. Cooking on salt gives it a greatly enhanced flavor over that of a frying pan. The mineral content in the salt gives it a more nuanced flavor than table salt, and the amount of saltiness it imparts varies with the type of food (moist foods absorb more salt, fatty foods repel it, etc.). Himalayan salt is also long-lasting and naturally antibiotic, needing little more than wiping with a damp sponge after most uses. Whatever you're serving up, you will be sure to do so with greater flavor and flair. Hand-carved in Pakistan. Click here to learn how to care for your Himalayan Salt BBQ Plank . And check out our Himalayan Salt Plank Scrubber Brush to clean your salt plank. Salt is a long-lasting, naturally anti-bacterial mineral so these plates require just a little care to last for many years. Simply wipe clean and dry between each use. Do not place in a dishwasher or leave in standing water or the salt will erode away. When using the salt plank for cooking, be sure to follow recommended safety and usage guidelines. As salt heats and cools, small cracks and fissures will naturally form, and after enough usage, they will cause the plank to split. To maintain the longevity of your salt plank, always heat it very slowly, and allow it to cool for 24 hours before reheating it. Made in Pakistan. Click here to learn how to care for your Himalayan Salt BBQ Plank . The salt plank is naturally harvested and packed in an allergen free facility. 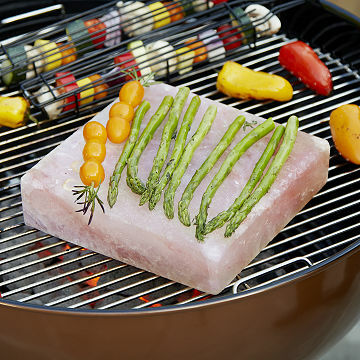 Anything we cook on this salt block comes out with more flavor than you'd believe. Grilling or baking this product will enhance the flavor of the food. For the time being it sits prominently in center of the dining table; we haven't cured it yet. We use it as a cutting board, gives peppers, meat and other veggies much more flavor that without. Gwe grilled on it for the first time, wow! What a great tasteful surprise! We use this in our oven, but would also be great for three grill! Super easy to clean with a scrub brush. Unfortunately this can damaged in delivery. Not usable! Use more in oven. Need bigger for BBQ/Smoker. Glad I bought proper cleaning tool or maybe afraid to clean well! We love the flavor this adds to the food we've made stuffed pork and shrimp on it so far. The only bummer is we've followed the directions for curing it and care, but we still ended up with a pretty large crack down the middle. Hopefully that's all we get and it will still work ok because we've really liked it so far. Mainly grilled burgers on it - very difficult to clean satisfactorily but produced some of the juiciest, tastiest burgers I have had to date. Great gift idea for person who just bought a grill!